or if you know how it seems, press the button! The finest fully crewed luxury yachts in the market for a memorable client experience! A big variety of motor yachts, catamarans, motor sailers and sailing yachts with permanent crew. New addition to our Fleet for upcoming season! An inimitable yacht for inimitable moment at sea! Cannot get Athens,Corfu,Kos,Lefkada,Paros,Skiathos location id in module mod_aw_weather. Please also make sure that you have inserted city name. Greece, the land of the sun and the ancient Gods offers unforgetable holidyas experience with endless variety of picturesse and location to see. Set sails to explore the wondrous islands and coastlines.Relax under sun and live the real adventure to explore all the secrets of each islands and beaches. Adventure begins. Let us help you to fond the best yacht for your adventure. Latest News from our Company and the yachting industry! The finest luxury crewed yachts in the market for a memorable client experience! Yacht Management, Charter Events and more addtional services! Lifetime experience...Thank you MG Team that made our vacations in Greece so unique! This picture describes our mentality and it is a small example of how our sailing experience was! We loved Greek Sea, greek food, greek hospitality! Everything! Thank you Mg Yachts for the amazing yacht and the support! This sunset near Sifnos will never been forgotten! Thank you for everything MG..
For one more year we left on your hands the organization of our sailing vacations in Greece! For one more year everything was great! 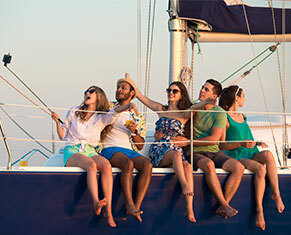 Ms. Mary and her team offered us for one more year a mindfree sailing vacations! The yacht, the services, the support...everything was perfect!